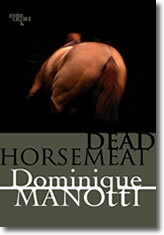 DEAD HORSEMEAT is the second book from Dominique Manotti to be translated into English, the first being the early 1980s set ROUGH TRADE. Both feature the openly gay Superintendent Daquin of the Paris Drugs Squad. The events in DEAD HORSEMEAT take place during 1989 with the political unrest in East Germany rumbling in the background and adding to one of the plot points. Daquin is called up late one night to come to a police station which is holding the son of a French minister for drug possession. Daquin arrives and cuts a deal with the boy, who gives him the name of his supplier, a groom at a racing stable. Daquin wonders if there's a connection here to the recent murder of a snitch at a race meet. From this snippet of information so begins an ever widening investigation, one that will bring down some big names in business and politics. Daquin's usual team is joined by Le Dem from the mounted police section. Daquin thinks of him as 'The Martian' but he soon proves extremely useful when he has to infiltrate a prestigious racing stable. DEAD HORSEMEAT has a complicated plot and is heavily populated with characters and so keeping everything straight can be quite a challenge. The present tense and varying first person point of view make this an incredibly fast paced, breathless read and translators Amanda Hopkinson and Ros Schwartz are to be commended on their interpretation. This is the dark side of Paris that tourists don't get to see. The police don't shy to use violence on suspects and to bend the rules. Even going so far as to plan to run a groom over so that Le Dem could take his place. Nonetheless these are police you want on the side of good and are both likeable and interesting. Unfortunately, as hinted by the title, there are some horse deaths and this makes uncomfortable reading at times but the rest of the book more than makes up for this unpleasantness and I found I couldn't put it down. Deservedly on the shortlist for The Duncan Lawrie International Dagger, you wouldn't get any complaints from me if it won.